Hair loss doesn’t happen overnight. Neither does becoming a hair loss expert. Experiencing hair loss himself and unhappy with the poor quality of available solutions, Sy Sperling finds a solution of his own. He starts Hair Club for Men and the business begins to grow by word of mouth. Hair Club airs its first national television commercials, featuring Sy Sperling saying, “I’m not just the Hair Club president, I’m also a client.” As he says that classic line, Sy holds up his own before photo, revealing the extent of his hair loss. The iconic spots quickly become a cultural phenomenon and within the first month of airing, Hair Club receives 10,000 telephone calls. To deliver hair restoration services to a wider audience, Hair Club expands to include Canada. Toronto becomes the first of 10+ Canadian centers across the country. Responding to a void in the market, Hair Club introduces customized female hair restoration solutions to meet the unique needs of women suffering from hair loss. After decades of success, Sy Sperling sells Hair Club to a private equity firm. Four years later, Hair Club is sold to hair care giant, Regis Corporation. To the extreme with EXT®. Hair Club introduces EXT Extreme Hair Therapy®, a solution designed for men and women in the earlier stages of hair loss. A combination of at-home products, including FDA-approved Minoxidil, and in-center services help slow further loss and regrow hair. Hair Club adds the FDA-cleared LaserComb, a form of low level laser (light) therapy, to its roster of proven hair loss solutions. This state-of-the-art, breakthrough technology stimulates cellular activity in hair follicles to promote growth and slow further loss. In April, Hair Club becomes a wholly-owned subsidiary of Tokyo-based Aderans Co. Ltd., the world’s leading provider of hair loss solutions, with more than 150 locations throughout Asia and Europe. A closer look at hair. After years of research and development, Hair Club introduces enhanced hair analysis technology for use in client consultations. 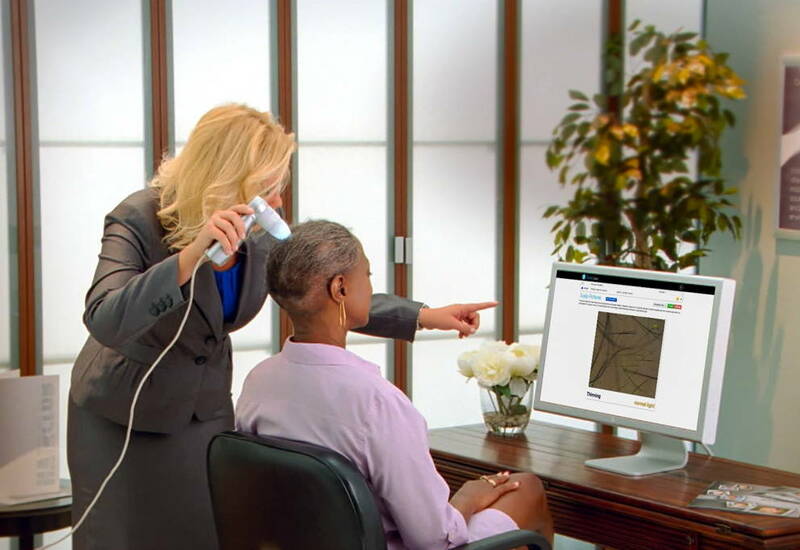 The technology provides an in-depth hair and scalp analysis that enables hair loss experts to determine the level of a client’s hair loss and which proven solution is right for them. To expand its non-surgical hair restoration options, Hair Club adds Xtrands® alongside its best-selling solution, Xtrands+®. Xtrands offers fast, natural-looking results for men and women in the earlier stages of hair loss. The first ever Hair Club women’s center. The first Hair Club salon devoted exclusively to female clients with hair loss is opened. A brand-new concept, this modern and upscale facility is located in Atlanta, GA, and offers pampering, spa-like services such as manicure and pedicure stations and massage chairs.